Should have been at an Egmont kick-off this evening, but the headache I've had since I woke up this morning told me to stay away from the booze today. Tomorrow there's the big Kolik party so I better be in shape for it! Were in Copenhagen yesterday bought some fun stuff, including this collection. "Harley and Ivey" is a must have if you like the art of Ronnie del Carmen, Bruce Timm and Shane Glines. And there are two stories written by Paul Dini too! 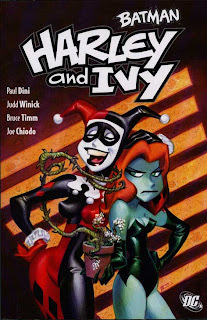 Harley and Ivy... Aight! So how much innuendo has it? Oh no, but I loved Robin Hood when I was a child, it was my favourite Disney movie.. maybe it's true what you say, I was just a child, but I don't really know. Maybe a possible lack of story or strukture is because it is one of those movies that isn't based on a single original story..? I don't remember exactly what happened but I think the concept of the Robin Hood movie changed quite a lot over the time it was produced. Personally I think that it's divided into small episodes that makes it unsatisfying to me. BTW: We sat down yesterday evening and watched parts the movie. Then we freeze framed when we saw good poses. 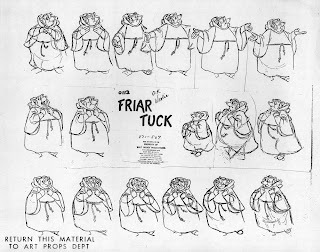 We then sat down and analyzed the movement, sketched the poses and tried to guess who did wich scene. 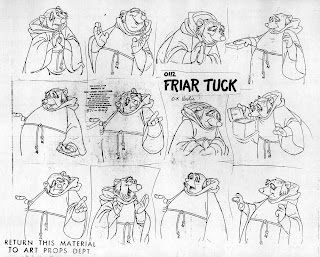 I think most of the stuff we sketched were Don Bluth and Milt Kahl scenes.